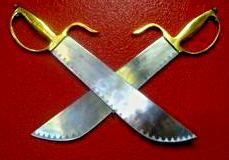 Wing Chun Butterfly Swords (Baat Jam Dao) are highly adaptable for today’s world. I almost gave him a chain punch to the head. It's a Shaolin weapon, and since Shaolin monks (Buddhist Monks) are forbidden to kill, the Butterfly Swords don't have a sharp point. 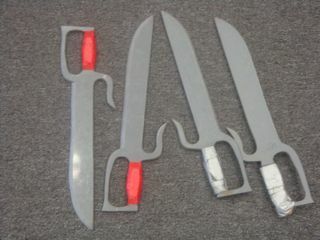 They're not designed for stabbing, just for slicing, cutting, and chopping -- your enemy to pieces. The Chinese name (in Mandarin) is “Ba Zhan Dao”, which means 8-slash (or cut) knives. In Chinese, "Dao" is directly translated into "knife”. "Jian" is directly translated into "sword". So technically, you could translate "Eight Cut Swords" into "Eight Cut Knives". In this case, I think the look and cultural background is more important than the direct translation. Most Westerners would agree the Butterfly Swords look more like small swords than very large knives. They’re designed for cutting, chopping, and slashing at a relatively close distance. I believe the English nickname, “Butterfly Swords,” comes from a few facts. The blades are broad and wide, similar to a meat cleaver, but with an angled or curved point. At high speed, the spinning and flipping blades begin to blur and look like the flutter of wings. The weapon consists of two identical swords used together as a pair; one for each hand. Many of the moves require you to flip and spin them around with your wrists. The length is important, too. Because you flip and spin them around with your wrists, they have to be long enough (or short enough) to spin without slicing off your own bicep or lacerating your armpit. Not too long and not too short… just right. The “hook” is a secret design ingredient. It starts from the top of the handle and follows behind the back of the blade, but shorter than the blade. This hook gives you the ability to control your enemy’s weapon by allowing you to safely “grab” it! Here's how: Cup your opponent’s weapon in the hook's opening, give your sword a twist which crates friction and locks up (or grabs) the opponent’s weapon inside the hook. Now, her weapon is jammed up and your second sword is free to do some quick cutting. The hand guard is used to protect the hand and fingers. Also, in a “Kan Dao” block the hand guards, along with the blades, present a very wide defensive barrier. Plus, in close range you can easily use the hand guard like a pair of brass knuckles to smash your opponent. Cut, chop, slash… How about smash, pound, crack? Instead of disabling and maiming through cutting, you can also disable and maim by breaking. Both are effective and accomplish the same goal - taking down your enemy. My sidi said that the Wing Chun Butterfly Swords is not practical. What he meant is you’re not going to find a pair of these lying around in a dark alley, if you get into trouble with the bad guys. Instead of two identical blades for cutting, you can use the same movements with two identical, or almost identical, sticks or batons for smashing, pounding, and cracking your opponent. In my Wing Chun academy we alternate and improvise with different two-handed weapons. My sifu will use two axe handles, we train with kali sticks, fighting with two knives at the time is a lethal combination, and I’ve fooled around with two child-sized aluminum baseball bats. The main thing to keep in mind is you want the improvised Butterfly Swords to be long enough, or short enough to spin in your hands without hitting yourself or getting caught in your armpits. If you want to train the Butterfly Sword form you can do what we do at my club, use plastic or metal training swords. Believe it or not, the plastic Butterfly Swords can be more dangerous for training. After you’ve banged up your pair, the plastic edge gets chips and nicks. If you try out a slashing move on someone, these nicks act like serrated teeth on a knife — you can, and will, get cut. So be careful! It’s important to train with metal Butterfly Swords because they’re heavy. The plastic ones are too light. The heavier metal swords strengthen your arms and grip. It also trains your balance. Most of the metal training blades I've used are heavy enough to act as a counter weight, which throws off my balance. You need to train with a realistic weight when you’re spinning and flipping the swords in your hands. The added benefit is you condition your hands and arms, and develop callous. What I mean by that is, if you use it… you choose to use it. Most people don’t walk around with it holstered to their hip just in case they run into trouble. So when someone, like my sidi, says that it isn’t “practical,” he means you’re not going to find a pair, or anything resembling it, lying around in a dark alley available in an emergency. … The Wing Chun Butterfly Swords is no different. The great thing about it, compared to each weapon mentioned above, it is highly adaptable and you have a better chance of finding many items that can be substituted in place of two traditional Butterfly Swords. Buy plastic training or real steel Wing Chun Butterfly Swords!